For too long, the ’centre’ of the Renaissance has been considered to be Rome and the art produced in, or inspired by it. This collection of essays dedicated to Deborah Howard brings together an impressive group of internationally recognised scholars of art and architecture to showcase both the diversity within and the porosity between the ’centre’ and ’periphery’ in Renaissance art. Without abandoning Rome, but together with other centres of art production, the essays both shift their focus away from conventional categories and bring together recent trends in Renaissance studies, notably a focus on cultural contact, material culture and historiography. They explore the material mechanisms for the transmission and evolution of ideas, artistic training and networks, as well as the dynamics of collaboration and exchange between artists, theorists and patrons. The chapters, each with a wealth of groundbreaking research and previously unpublished documentary evidence, as well as innovative methodologies, reinterpret Italian art relating to canonical sites and artists such as Michelangelo, Titian, Tintoretto, Veronese, and Sebastiano del Piombo, in addition to showcasing the work of several hitherto neglected architects, painters, and an inimitable engineer-inventor. 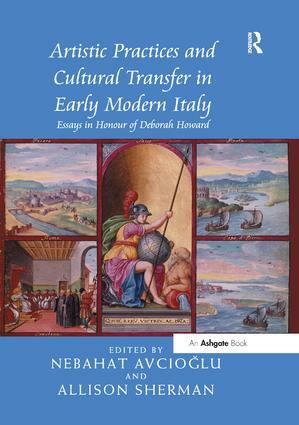 Contents: Foreword: ‘More hours in the day than anyone else’: the multifaceted life of Deborah Howard, Patricia Fortini-Brown; Introduction: Reframing the Renaissance, Nebahat Avcioglu and Allison Sherman. Part I Another Rome: Planning for pilgrims: parallels between the burgh of St Andrews, the Vatican Borgo and Compostela, Ian Campbell; Bad colours for the pope: Tintoretto, Giovanni Grimani, and the decoration of the Cappella Gregoriana in New St Peter’s, Benjamin Paul; The one-room apartment of Cornelis Meijer, Joseph Connors; ‘Un’architettura di diversi’: Carlo Rainaldi and the controversial attribution of the Palazzo Mancini in Rome, Manolo Guerci. Part II Peripatetics of Knowledge and Architectural Practice: Live words and experience in early modern architecture, Christy Anderson; Material matters: training the Renaissance architect, Ann C. Huppert; Architectural treatises and the East Adriatic coast: cultural transfer and the circulation of knowledge and in the Renaissance, Jasenka Gudelj. Part III Networks, Innovation And Praxis: Painting together: ‘a terrestrial trinity’ of painters in the Quadro delle tre mani, Philip Sohm; Milling the bread of salvation: art, patronage and technology in the de Lazara altarpiece in Padua, Catherine Puglisi and William Barcham; Paolo Veronese invenit et delineavit, David Rosand. Part IV The Evolution and Variation of an Idea: Michelangelo’s St Peter’s and a neglected early drawing, David Hemsoll; The chronology of Titian’s versions of the Venus with a mirror and the lost Venus for the Emperor Charles V, Peter Humfrey; The portraits of a lady, Paul Joannides. Select bibliography; Index. Nebahat Avcioglu is Associate Professor of Art History at Hunter College, CUNY, USA. Allison Sherman is Adjunct Assistant Professor of Art History at Queen's University, Canada.